This scholarship test will help you bring out the streak of brilliance in you, and will ensure that you are rewarded adequately for the same, for no mark of brilliance in a CA aspirant should go unnoticed. Here are a few things that you should know about the CA Intermediate Scholarship Test before attempting it. It’s free, so you don’t have to spend a shilling – You just need to register for the test and attempt it (and score well, of course). It’s online – No pencils, rubbers, sketch pens, markers required! Just bring your merit along and that should be fine. It’s within the scope of your syllabus – You don’t need to prepare separately for the scholarship test, it will be within the scope of your CA preparation syllabus. It’s time bound – You have to answer 50 questions with the duration of 45 minutes. So, you better hurry up! There will be negative marking - Each question carries 1 mark for correct answer and for every wrong answer 0.25 mark would be deducted. Minimum cut off for availing scholarship - A minimum of 40% is required to qualify for scholarshipTop of Form. Based on your performance in the scholarship test, you will be entitled to a rebate on our CA Intermediate Course conducted by the faculty of JK Shah Classes. You can avail a discount of up to INR 10,000 based on your score. 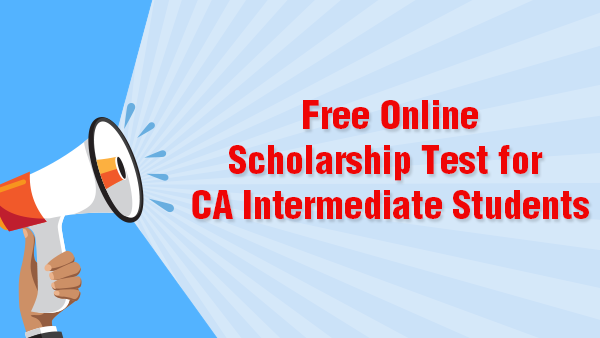 Take the fullest advantage of our free online Scholarship Test for CA Intermediate students now and set yourself for the best deal ever. Hurry up, for an offer as lucrative as this one won’t last forever!